I've finally redesigned my blog. 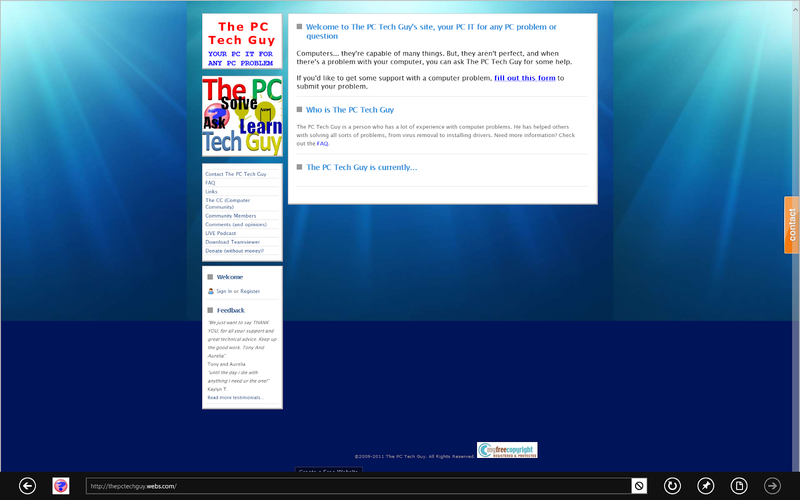 After a year of using, tweaking, and testing this template on other blogs, I have finally converted this blog's template. I'm pretty sure there's a few nuances to work out, such as the ad covering the date of the second post and comments slightly overlapping some elements, but other than those few things, it looks like everything else is working well. Posts now use more of the screen instead of being restrained to a fixed-pixel width, and can adapt to mobile browsers. I've also changed the logo to match a more Metro/Modern-ish look - however, I have yet to settle on a final design. Going forward, I most likely will be reviewing Windows 10 universal apps, as well as developing one of my own. Speaking of Windows 10, it's been quite an experience. I was a part of the insider previews, which was nice since we got to see builds of Windows in development, and provide feedback. I particularly liked Cortana and the ease of developing universal apps. However, one thing kept seeming to not get very many improvements - the Metro version of Windows 10, also known as "Tablet mode." 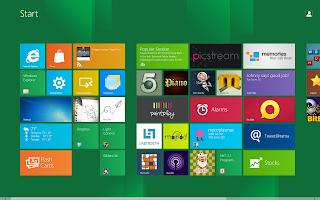 Many of the things that débuted in Windows 8, such as the charms bar and customizable Start screen backgrounds, were stripped in Windows 10 with no or a few crude alternatives. 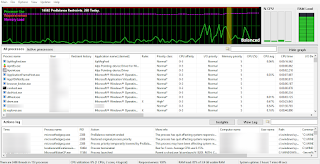 This situation continues to exist in the final version of Windows 10 today, which is a disappointment. While I understand that the desktop and gaming crowd, which could care less about Metro apps or Windows tablets is quite vocal, I'm not sure that this should lend to simply removing time-saving, touch-friendly actions. Nonetheless, in the name of consistency, Microsoft has turned on their own Metro design principles. Much of this could be solved by focusing more on either restoring or improving upon the touch-centric UI from Windows 8 into Windows 10's tablet mode. The only thing that appears to have a bit of thought into this was the Start screen, which weirdly attempts to emulate Windows Phone, with the exception of jamming as many columns that will fit the width of your screen - which, I'm sorry - just doesn't work with Windows tablets, which are primarily in the landscape orientation. Trumpet "consistency" all you want - but for a full-screen area filled with tiles, Windows 8 did this right - and was much more personal, too. And if you haven't noticed, the Blog address has been slightly modified - it now matches the YouTube username of The PC Tech Guy. The first thing you will notice when you boot up Windows 8 is that you have a lock screen, similar to a smartphone lock screen. Simply drag it up, double click it, or press any key to login. 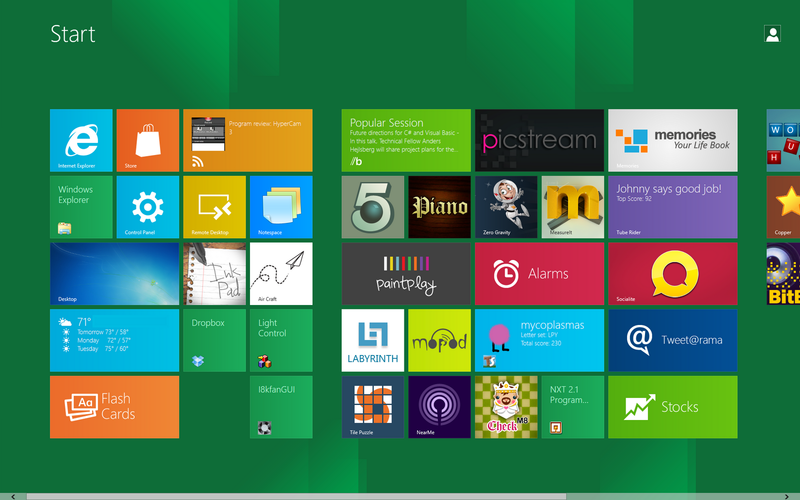 After logging in, you will be presented with the Start menu - yes, that is the new Start menu. If you're looking for the Desktop, simply click it. However, contrary to what most might think, the Desktop code is not loaded until you decide to open the Desktop! If you happen to use Windows 8 on a tablet, you may never use the Desktop - if so, then it isn't loaded, leaving more system resources for the Metro Apps. After you have opened an app, it may display some extra information about the app upon the next time you open the Start menu. For example, the News app will show various headlines after you have added some feeds to it. Games may tell you about your current progress or awards you have acquired so far. You can access the Start menu at any time by moving your mouse all the way to the bottom left corner of your screen, from any program. 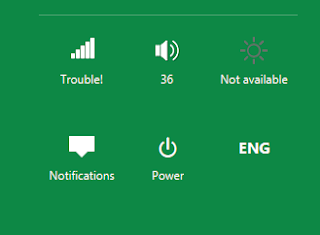 You can also use this to check the time, battery life, network status, and adjust a few settings - for example, clicking the "Settings" submenu brings up options such as volume control, network, notifications, or to shutdown/restart/sleep, all without ever having to remove focus from the current program. The Metro apps run at full screen, with a splash image a moment before it's opened. Although some of them appear to be similar to regular programs we use, such as Internet Explorer, the Metro version has a much-modified UI. 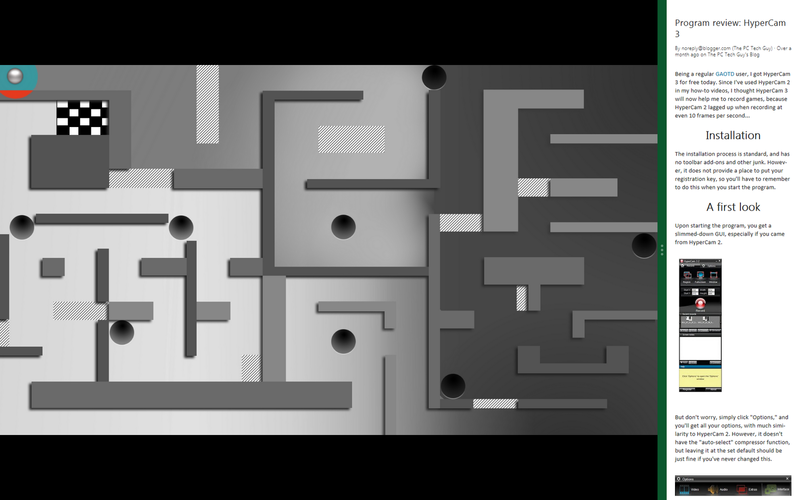 For example, this image below shows the minimal UI elements, displayed at the bottom. Despite the minimalistic look, this Internet Explorer app has not "lost" any features. (It in fact takes on the settings that can be set in the traditional Internet Explorer.) You can create and switch between tabs via right-clicking. Right-clicking will also show options in all the other apps. There are two other useful features to note about Metro Apps - for one, you can snap them to the sides of another app (including the desktop). However, it isn't Aero snap, where you would have two windows split in half - instead, one app has more screen real estate, while the other sits on the right side. This can be useful, such as keeping an eye on a news feed or stocks, while doing some work/playing a game. 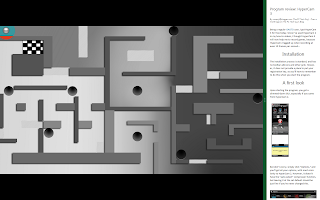 The Labyrinth and News app, with the News app "snapped" to the right. To snap an app, simply move and hold your cursor toward the left edge of the screen. If another app is running, a little preview window of it will appear. Then, simply click and drag the app to the left or right of the current app. The second useful feature is the quick switch - Simply hold the Windows key while pressing the Tab key to quickly switch between apps. The Metro user interface is extremely easy to use. I personally never thought that Microsoft would have this - they're doing a very good job in making the user experience a much easier, time-saving experience. In addition, the new UI brings the power of Windows to the tablet, with tablet-designed apps. Before, Microsoft attempted to cram tablet features into the Windows desktop - now, it is completely independent of it, allowing for a complete, tablet-friendly experience, without scrapping the power of the Windows operating system. The Microsoft Developer Network has provided three different variations of Windows Developer Preview that you may download and use for free. Please see their website for details and downloads. The installation process is standard, and has no toolbar add-ons and other junk. However, it does not provide a place to put your registration key, so you'll have to remember to do this when you start the program. Upon starting the program, you get a slimmed-down GUI, especially if you came from HyperCam 2. But don't worry, simply click "Options," and you'll get all your options, with much similarity to HyperCam 2. However, it doesn't have the "auto-select" compressor function, but leaving it at the set default should be just fine if you've never changed this. You can easily select a region or window with the buttons above, and enter in values for exact ratios. 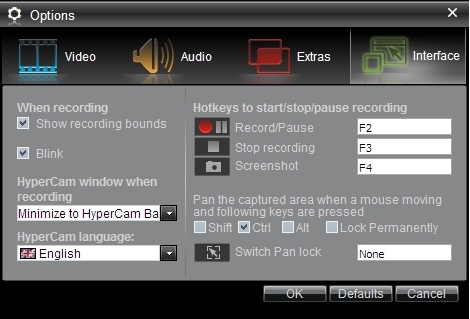 If you set the region to flash while recording, it's not going to flash like it did in HyperCam 2. 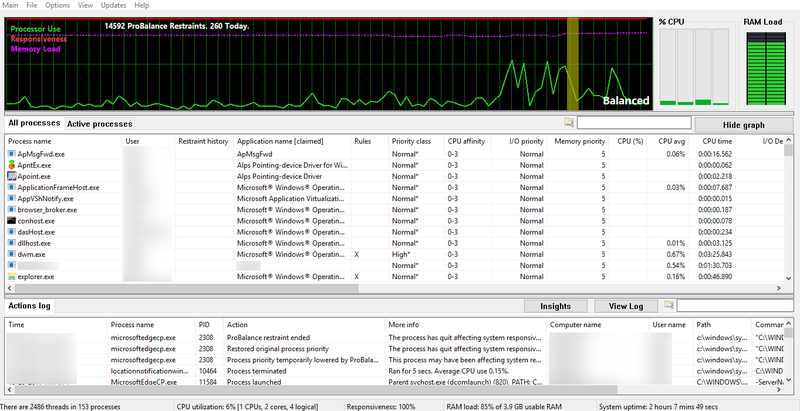 Despite this, it isn't going to lag up and get in your videos, even though it appears to do so. What's also nice is there is now a toolbar, allowing you to easily pause or stop a recording without having to remember the shortcut keys to press. One thing I was never able to do with HyperCam 2 was to record at 30 FPS (frames per second). I was able to max out at 20 FPS before HyperCam complained about too high of a framerate. I was able to successfully record at 30 FPS when doing a standard test of it, without having a resource-intensive Direct3D game running. So, I tested it out on Minecraft. The result was that it started lagging my game--and my computer. At least it didn't complain about a high framerate, so I am able to record, but to record games in high quality, I guess I'll have to use something like Fraps to record those. HyperCam 3 comes with a built-in video editor. It's an extremely stripped-down version of the most basic editor you can get. It has sound adjustment and basic trimming tools, but it is not cutting-edge, as the website claims. If it had frame-accurate trimming, then maybe it would be useful, but I prefer not to bother with it. However, it might be useful to those who make computer tutorials and don't need to do a substantial amount of editing. 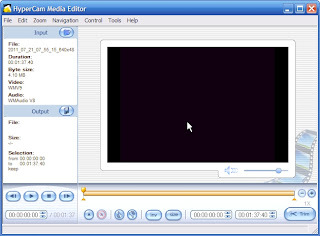 By the way, I use Windows Movie Maker to edit my videos (and you can do all sorts of stuff with it, it's not just for simple editing), so I look for screen recorders that save videos in a format compatible with Windows. However, this was easy for me in HyperCam, since I can choose what encoder to use. There is a screen notes feature that is present, but since I've never used screen notes, I don't think I can give an opinion on it. I just simply add annotations to my videos during editing. Even though HyperCam 3 is paid software, you only get a small watermark in the top-left corner on your videos. And, if it was like HyperCam 2's watermark (although HyperCam 2 is now free), it gets smaller if you select a bigger region. One particular feature I like about HyperCam 3 is the ability to backup your license key. Although it could be just a text file disguised under a proprietary file extension, the fact that it's there tells you that the developers were keeping in mind that something could happen to your computer in which you would need to reinstall the program. At the price of $30, HyperCam 3 boasts some huge advancements over HyperCam 2. It also records sound well (unless you're lagged out), and the ability to choose the encoders you have on your computer make it compatible for any editing program you choose. Although I'd like to see other features, such as zooming-in/out while recording, I give it a thumbs-up, especially if you have a sluggish computer and want to record at 30 FPS. I'd highly prefer it than using other screen recorders, such as Camstudio, which had a knack of recording the "busy" state of my mouse, despite whatever state it was in. However, if you care less about the framerate, and want to get rid of the watermark without having to pay, then I'd suggest you can go for the freeware alternative HyperCam 2.